Well, having finally got my hands on the product and used it almost daily for about a week (it’s a gradual tan), I can safely say that it works! Simple. First cleanse your skin in the shower with a body wash. Then with the shower switched off, apply a generous amount of lotion in circular motions to wet skin. Wait three minutes, turn the shower back on and rinse off with water only. When you’re done, step out the shower and pat skin dry (just dab, don't rub). After showering, the self-tan actives will naturally start to work, developing gradually. For a darker colour, repeat the process (I tend to do consecutive nights until I’ve reached my desired colour). This really is dead easy to use and quick to apply. It smells pleasant, it leaves skin soft (it contains nourishing sweet almond oil), it dries quickly (reducing the worry of the formula staining your clothes - it hasn’t mine), and it’s reasonably priced (£14.50 for 200ml). Most importantly for me, I’ve been streak-free (thus far)! 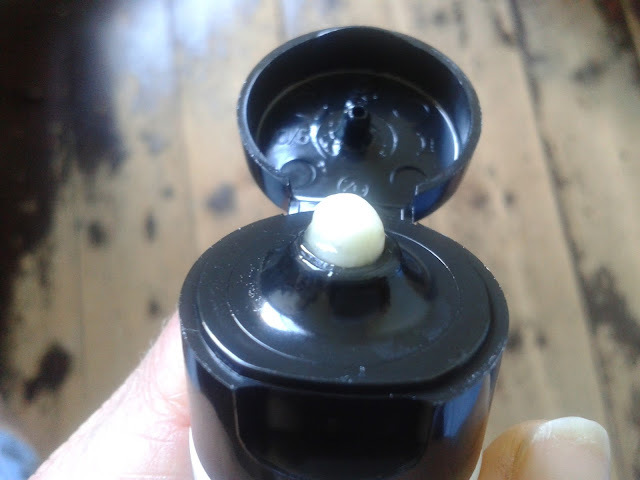 Plus it leaves you with a most natural light golden colour (I’ve mentioned on this blog before that a lot of self-tanners develop too pink for my olive undertones – hence my fondness for Xen-Tan who formulate especially for olive skins). - St Tropez says to wash palms after application. I’d say also make sure you wash the inside of your wrists! I speak from experience! 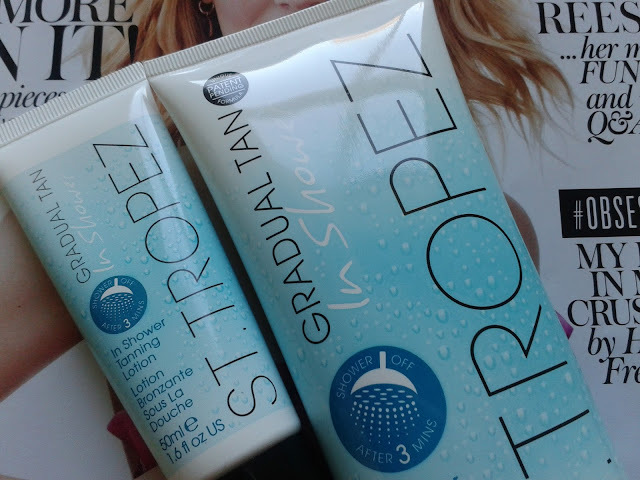 Having used a lot of different brands and products over the years, this new St Tropez formula is currently my favourite to apply. It’s so easy to use (you don’t need a mitt), and I feel confident that I’m not going to wake up the next morning with any nasty surprises (i.e, streaks). It also fits perfectly into a busy lifestyle – I can even see myself applying this in the gym shower after a workout! – and it does give a most gorgeous natural looking tan. You can pick up a free 50ml St Tropez Gradual Tan In Shower with the current issue of Instyle (main pic). There’s also a £2 off voucher inside. Otherwise, the product is available at Boots here (I got £4.50 off in-store this week but the website is currently showing ‘buy 1 get second half-price’). I think this sounds brilliant - being able to apply in the shower saves so much time. Going to grab Instyle and wait until my holiday tan starts to fade then use this. Wow this looks amazing! May have to pick one up :) I am a tan junkie! This sounds great. 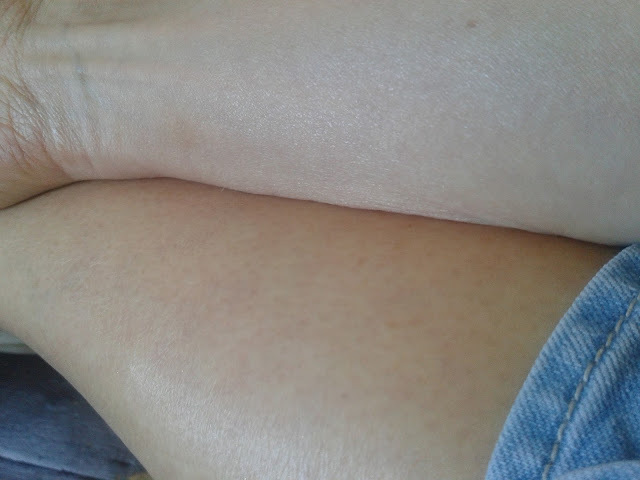 I've recently become obsessed with using gradual tan and I love my Dove one. I think it must be good, a good brand and I trust your recommendations, for sure! This time, as usual, I will be honest and before I say "I will use it", and I guess you know me by now to know that when I say I will look for something it is because I will, so, long story short :) I never used self-tanning :) I used to wear tights to cover my white legs, cause some countries make fun of very white people, but now I go bare legged anyway :) Please don't take me wrong :) Ih, today I am afraid of saying anything. A "friend" of mine - how do I stop it? - has already insulted me a lot, and I am afraid of saying the wrong things now! :) Hope you have a great week!